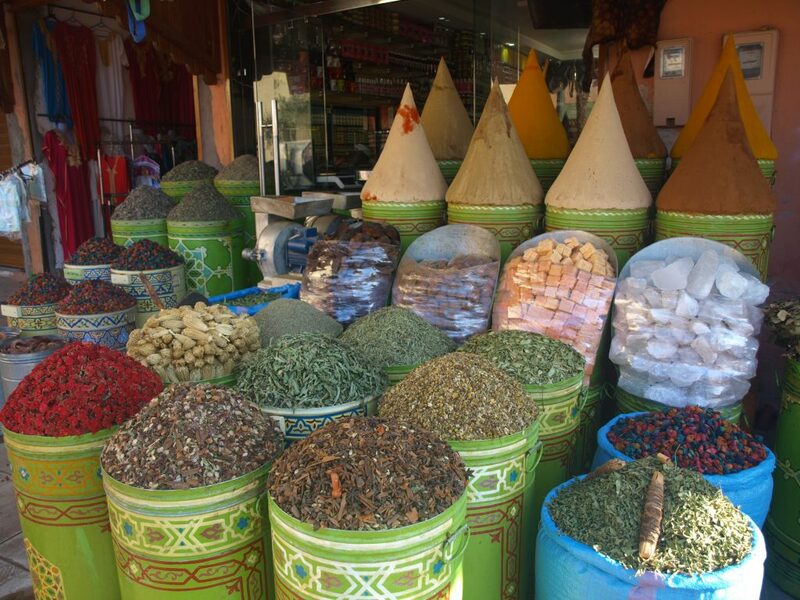 Marrakesh - life & all the rest of it! 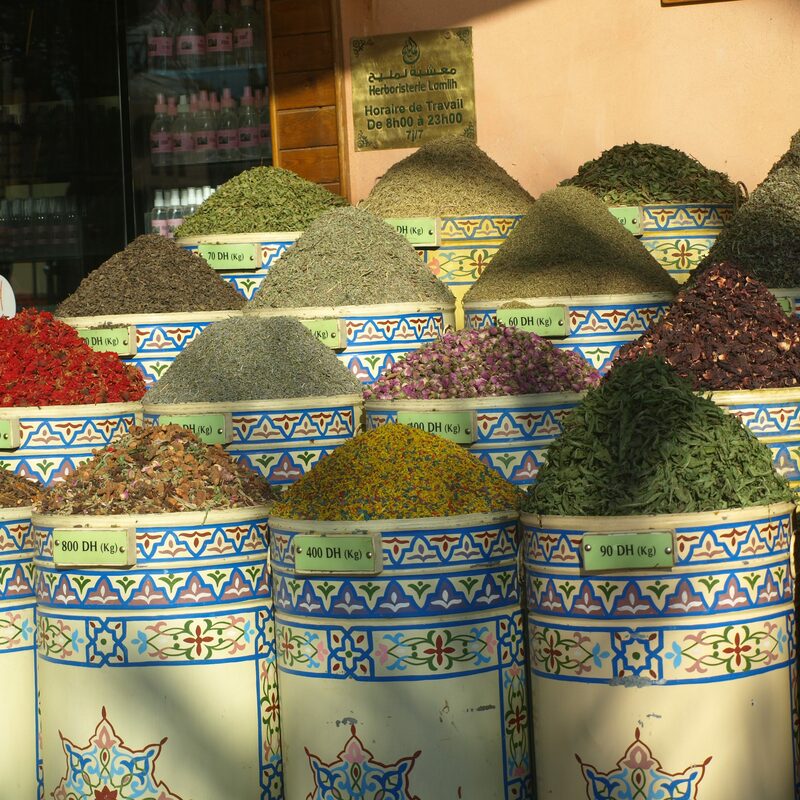 marrakesh – life & all the rest of it! 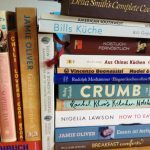 a summary of – well: “life & all the rest of it” (go on reading!). The later the day the fuller is Djeema El-Fna – especially from late afternoon on more & more food stalls open and more & more jugglers & impostors fill the space w/ snakes, fire-eating, sword swallowing, music… Somehow the market place – at this time of the day – reminds me of some fake medieval fair in a historic Hollywood B movie – that’s definitely not my scene! 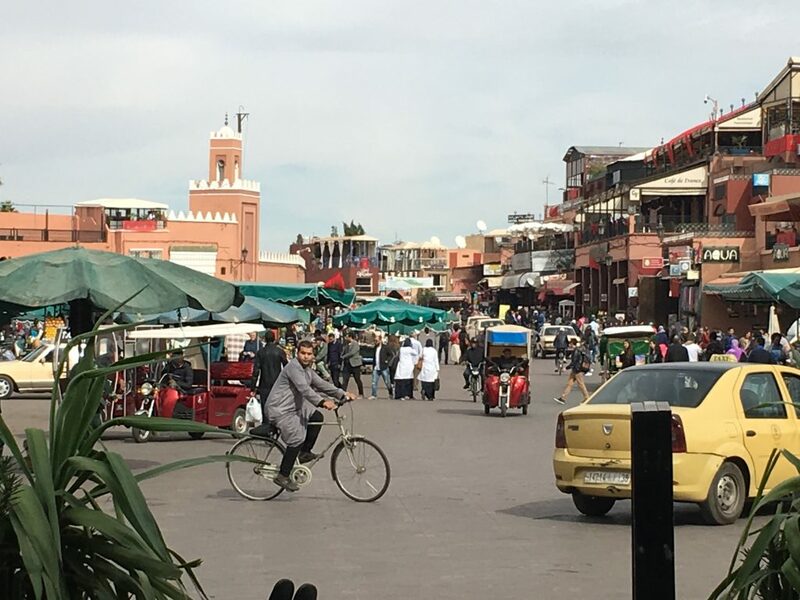 The Medina is the heart of Marrakesh – from the very beginning (you may also call it “old town”…) … & Djeema El-Fna is the center of the Medina. The Medina is walled by extensive ramparts which are undestroyed until now. 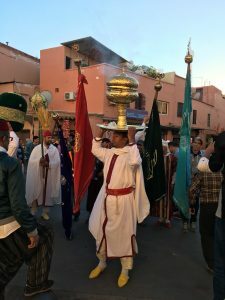 There are lots of gateways leading into the Medina (… & it’s essential to know the right gateway if you ask a taxi driver to take you to your riad… – more about this later…). 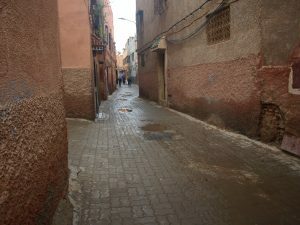 Most of the streets & alleyways in the Medina are narrow, very narrow lined by high ochre walls of mansions & houses. 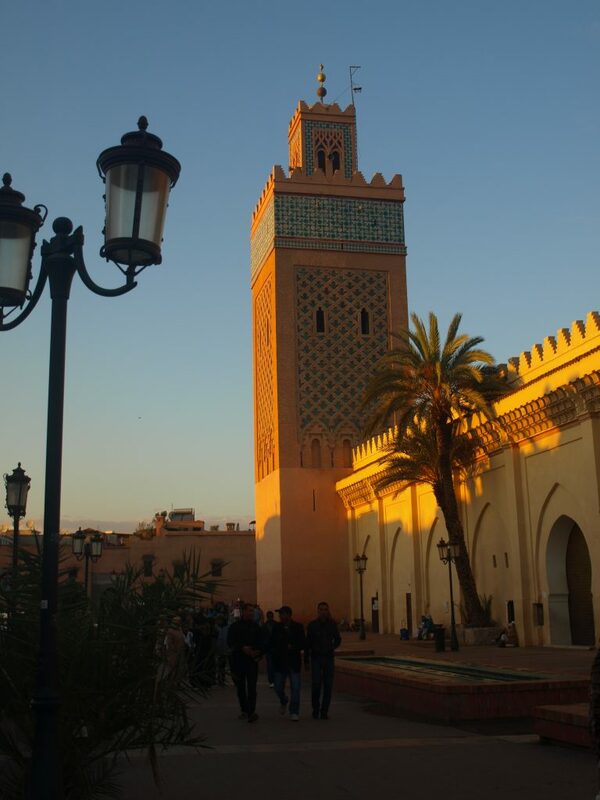 Within the Medina there is the Kasbah, another walled city from the past fortified in the 11th century. 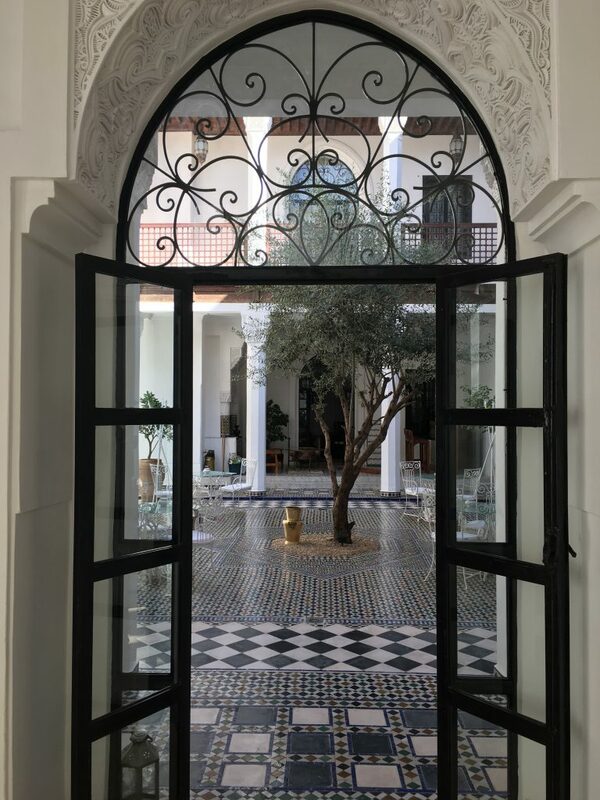 The heart of the Kasbah is the Royal Palace which is – of course – walled once again… In Marrakesh all these ancient walls & ramparts & palaces & fortifications are intact. With some restrictions – e. g. the Royal Palace – you may walk all over the place & admire them. 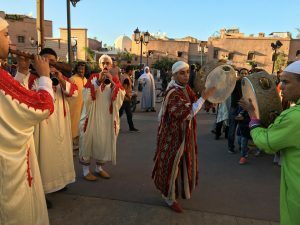 Did time stop in Marrakesh? 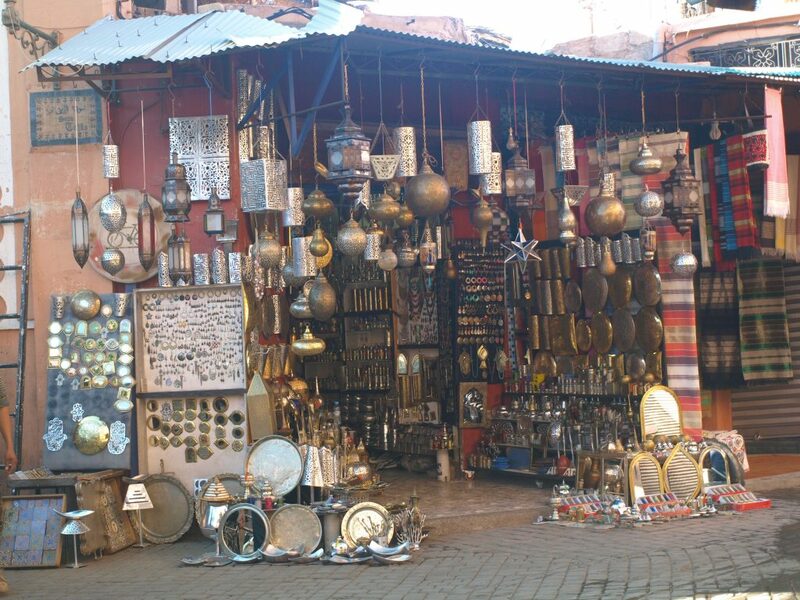 No – just remember the satellite dishes… & you won’t miss the experience of lots of motorbikes dashing through the alleyways all the time… & you won’t also miss almost everybody engrossed in her/his smartphone’s display..
Once we’d entered the riad quite another world opened to us! 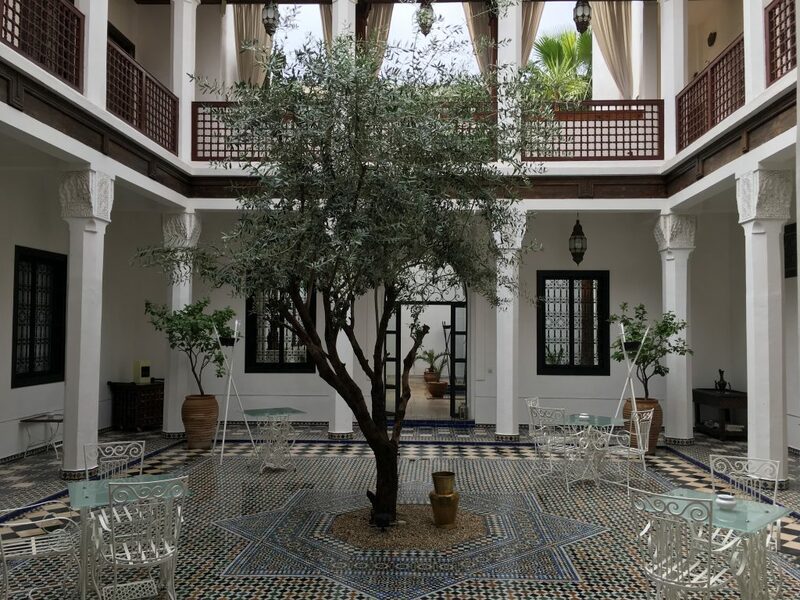 The riad has only 7 rooms located around the courtyard. The inevitable fountain is replaced by an large olive tree. 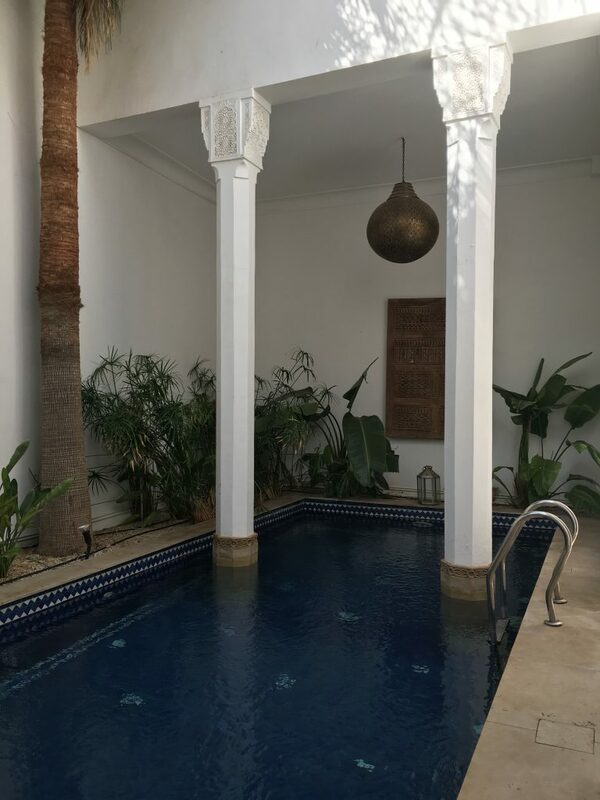 We were surprised at the quietness inside the riad: only splashing from the pool & chirping of lots of birds living in the palms. 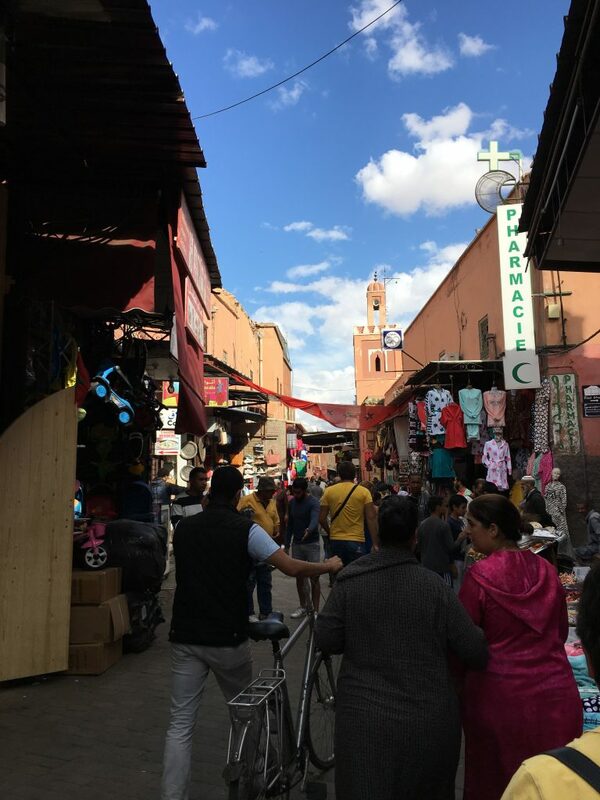 While Medina’s Southern part is rather open & joins the “rest of Marrakesh” there is the “maze of alleyways” mainly in the North & East & West… around Djeema-El-Fna. 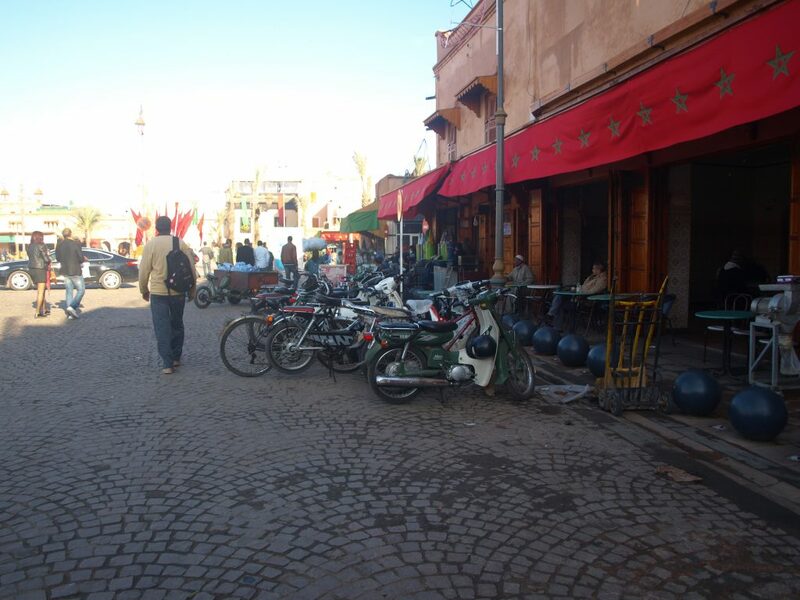 The “rest of Marrakesh” is a very modern city – I’m thinking of quarters like “Nouvelle Ville” etc. which resemble modern Southern European cities w/ shopping malls, glittering hotel facades, 4-lane-roundabouts etc. 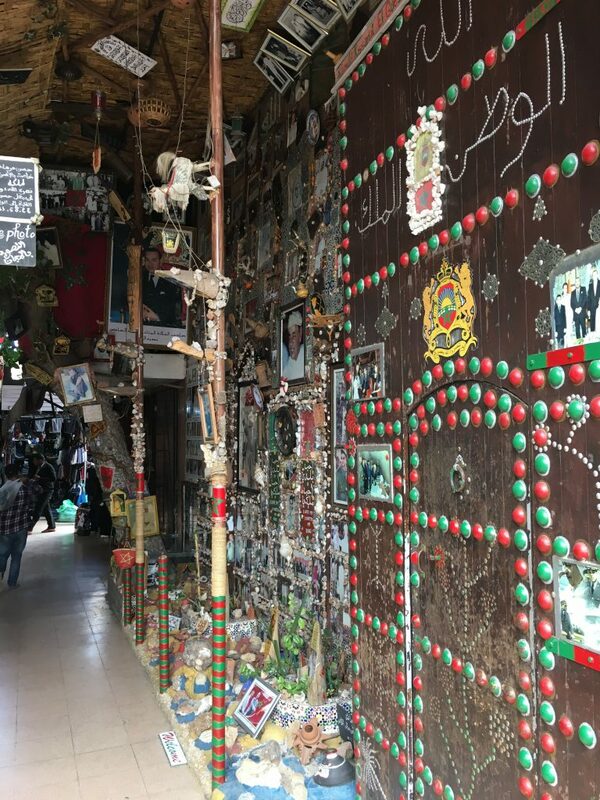 We made only a single short trip into this part of Marrakesh which is a lot larger than the Medina when visiting Le Jardin Majorelle – YSL’s legacy. Coming back to Medina’s maze & the traffic. 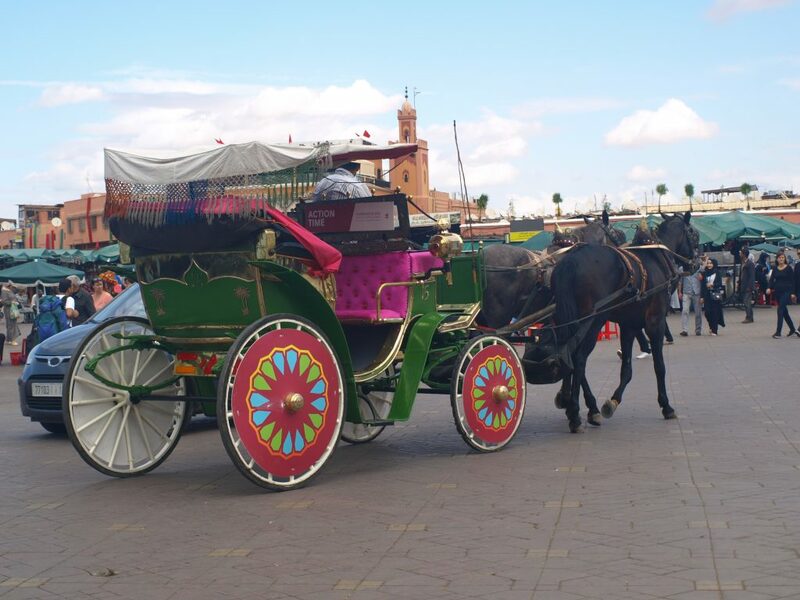 This is typical for an afternoon on Djeema El-Fna: lots of stalls, lots of people/tourists, lost of yellow taxis, lots of bikers & Moroccan “tuk-tuks”, donkey carts, colorful horse-drawn carriages… Be sure that each alleyway in the Medina is crowded w/ taxis (if wide enough! ), w/ motorbikes (I estimate that there are at least 10 motorbikes pro taxi!) & all the rest mingling w/ locals & tourists – often a risky adventure. Always stop a running taxi at the curb – never go to a taxi line. 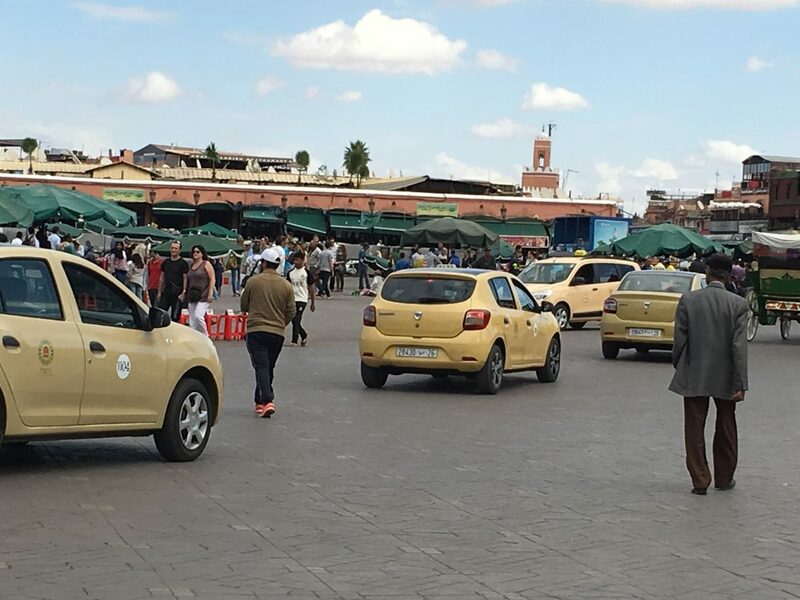 Always agree upon the price before entering the taxi – it’s always 20 dirham in the Medina & 30 dirham when leaving the Medina for Nouvelle Ville or so. The fix price includes the tip. 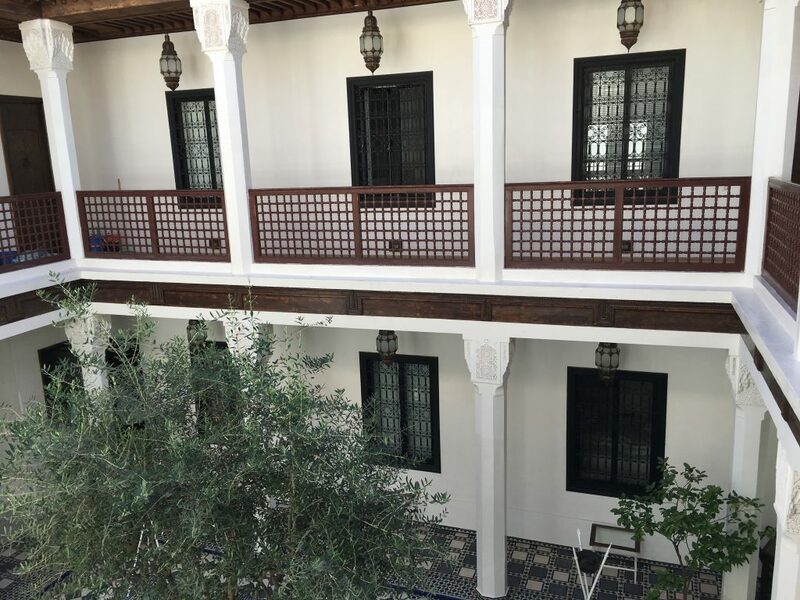 There are hundreds of riads in the Medina: no taxi driver knows about all of them… or even some of them… So if returning to your riad ask for the next gateway in the ramparts. 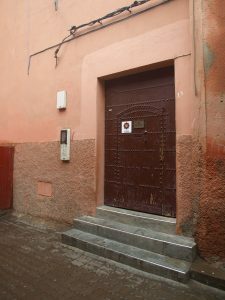 The taxi driver will take you from the specified gateway as far as he can manage in the alleyways – meaning for us about 10 min walking from the nearest drop point to our riad: fine! I’ve tried to picture some of the alleyways we walked. 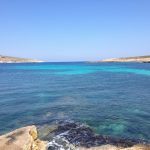 Attention: these are photos are taken during daylight – when it’s dark there are no shops, no stalls, nothing but ochre house walls w/ shutters & big doors (everything is shut down!). 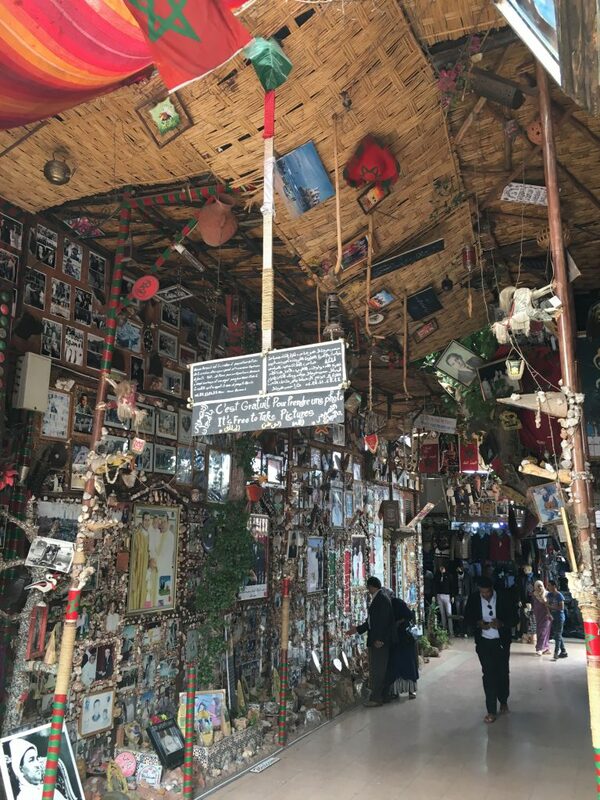 It becomes difficult to find your way because the alleyways look all alike… nevertheless it’s very interesting to walk them during daytime! 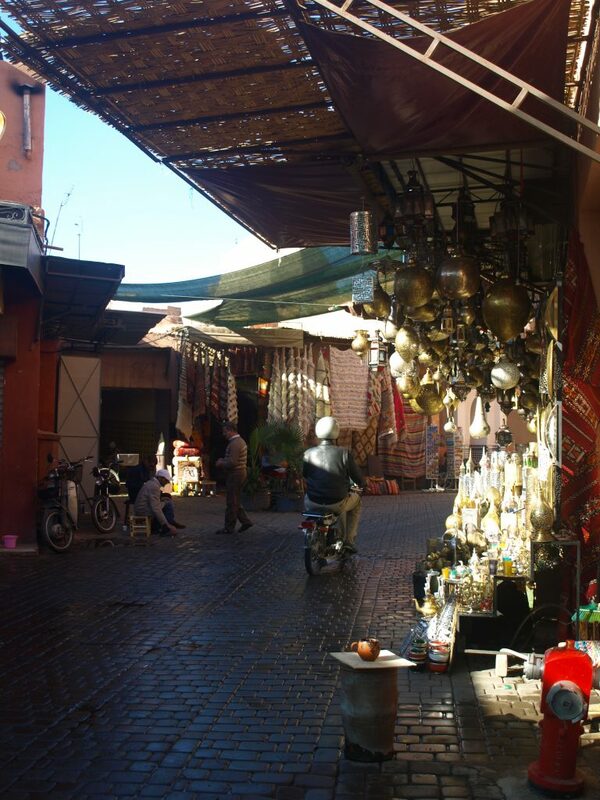 … & there are the souks! The souks sprawl from Djeema El-Fna mainly to the North. 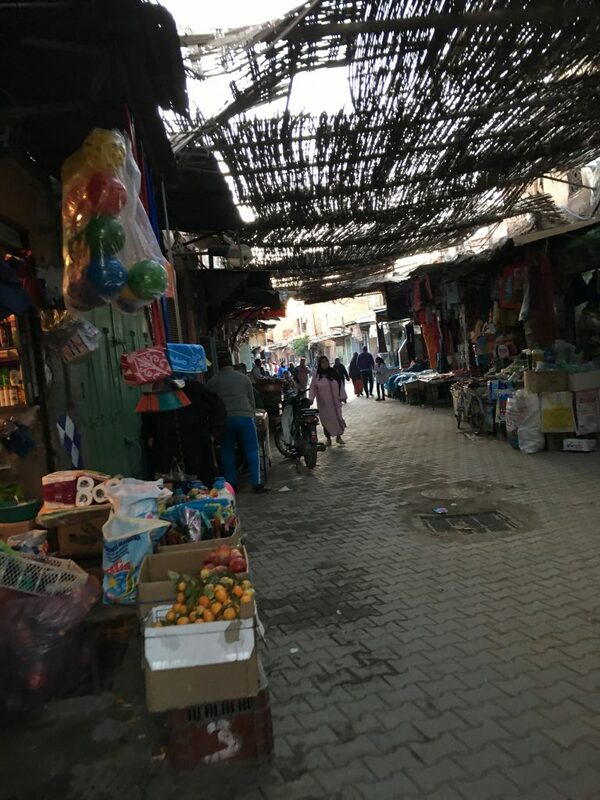 Most simple approach: souks are covered alleyways w/ shops & shops & shops… sometimes clustered along professions like carpet making/selling, coppersmiths, leather tanning etc. 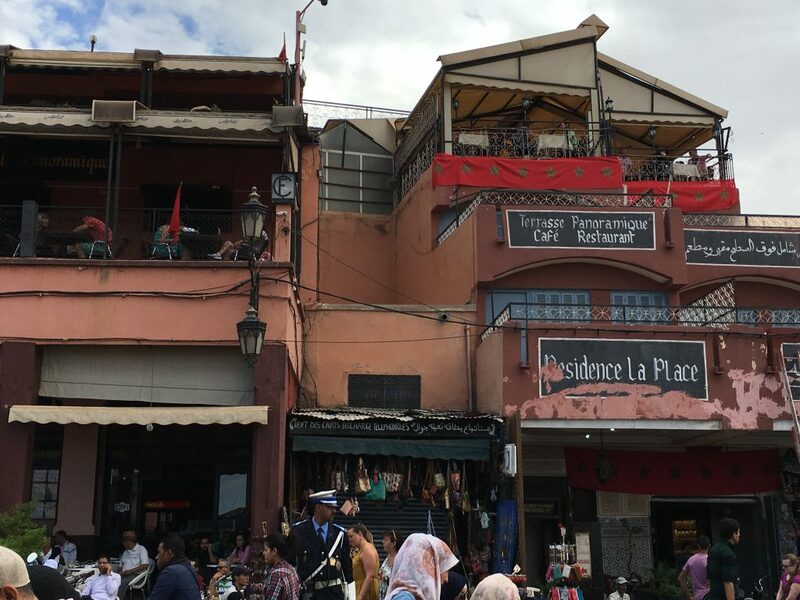 The souks are famous for their diversity, the haggling & bargaining, locals & tourists… You may get lost in time & space – especially because in the souks somehow all corners seem to look alike: don’t panic! Just proceed & you’ll end up either on Djeema El-Fna or near Ali be Youssef Medersa at the Northern gateway or… You cannot get lost! 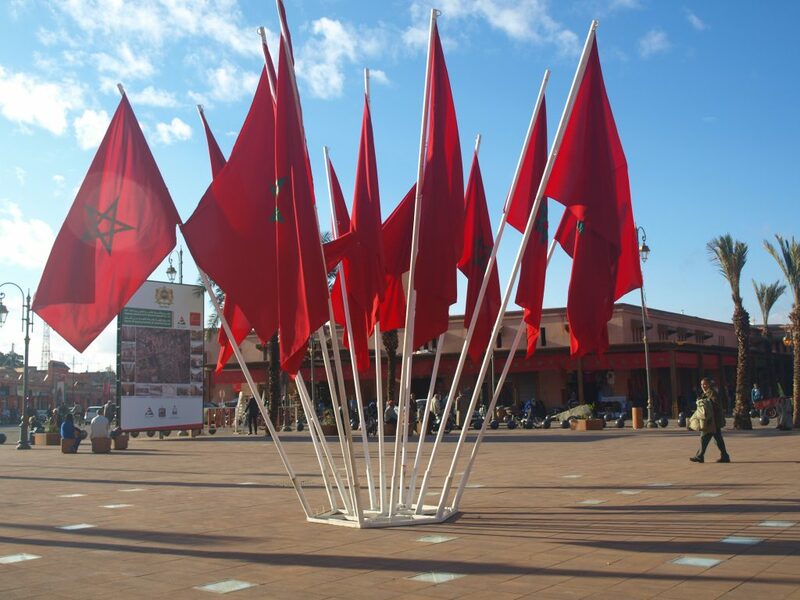 By the way: Did I mention that French is 2nd language in Marrakesh resp. Morocco? 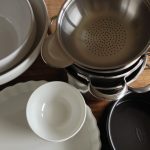 Be prepared because all menus are in French (& only sometimes in English…). 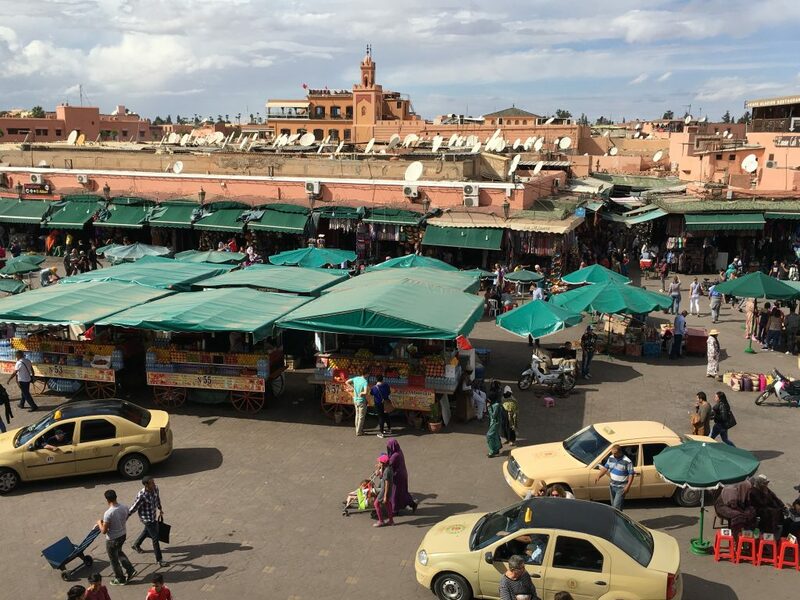 Well – of course – there’s the French heritage meaning you’ll get premium baguette, fresh croissants, delicious pain de chocolate… all over the Medina at lots of bakery stalls. In addition there are small round flat breads (it’s the Moroccan style bread!) accompanying each meal. It’s a deep earthen plate with a cone shaped cover/lid. 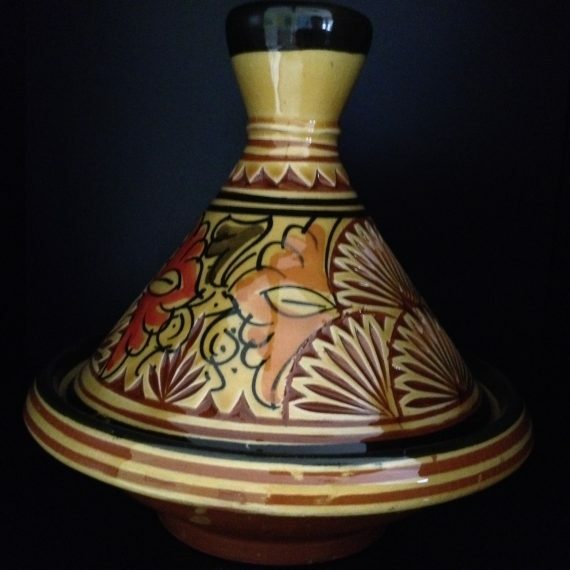 You put meat & spices/herbs & vegetables (optional) on the plate, cover the plate, put the tajine on blazing charcoal & let it work for some hours: that’s the classic approach (I’m not sure if each Moroccan restaurant/café manages a tajine this way!). 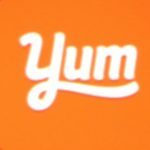 kefta (aka meatballs) w/ tomatoes in a spicy sauce topped w/ a fried egg. 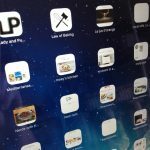 I learned that some of the combinations are traditional – & I think there are more adjusted to tourists’ likings. 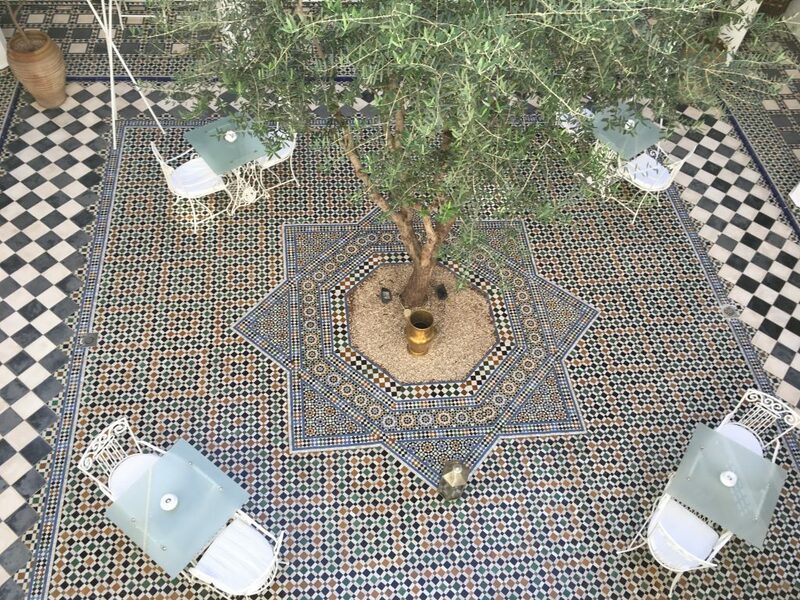 Our riad offered a 3-course dinner each evening & we enjoyed once in a while. I was especially fond of the dessert because it was always a delicious very French style dessert! We loved diving in this world & watch & experience a world, somewhat strange, somewhat familiar!